What's inside a princess' purse? true royalty never tells. (Besides, it's what's inside a princess' heart that matters.) your friends may have purses...but nothing like your play circle princess purse set, an 8-piece pretend play purse filled with all the essentials. Keep small treasures (or a handful of enchanted fairy dust!) in the coin purse, look stylish in your matching pink glasses, and practice putting on some glitz with the pretend makeup kit including a pretend lipstick tube and compact with a mirror. Need some more supplies? head out to pretend shop with the credit card, and lock your castle up tight with the keys and keyring. Keep in touch with the fairy princesses back at the castle with your cute pink cellphone that has any feature you can imagine!made from food-safe plastics, it's ok if someone forgets the “pretend” part of the pretend make-up. For the full pretend-play princess experience, mix and match this pretend purse accessory set with other play circle princess items like the princess birthday party cake set, and the sweet treats ice cream parlor set. Keep those sunglasses on because the future for this princess is looking pretty bright from here! Complete kids pretend purse set: the Princess purse set is the perfect purse to take to the ball, or the ballgame! with all the play makeup, pretend credit cards and cellphone, your purse has everything you need! keep it all safely inside with a handy velcro closure so your treasures don't fall out. This kid's toy purse set is sized perfectly for small hands and big imaginations. Realistic details: all the fun with None of the mess! the pretend makeup compact and lipstick look just like the real thing, and this Princess purse has all the essentials that mom would normally carry. Teach and learn: explore a range of life lessons and educational topics with your little one and encourage their imaginations. Imitation and role play, fine motor skills, and social skills are just a few of the learning options for this kid's purse toy! 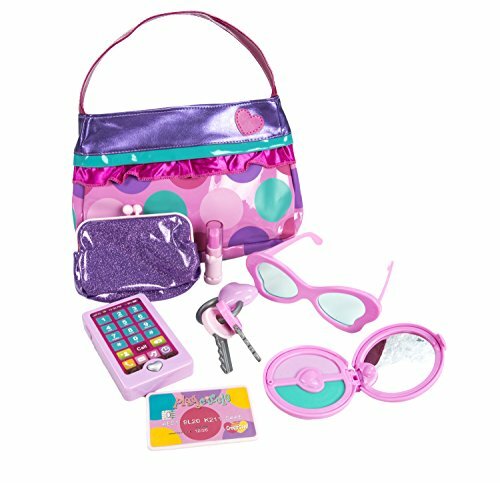 Includes: (1) purse (1) coin wallet (1) pretend cellphone (1) pretend lipstick (1) pretend makeup compact (1) plastic credit card (1) pair of dress-up glasses (1) key holder with keys. Safety and materials: made in China from recyclable plastics that are free of lead, BPA, and Phthalate. All play circle products meet or exceed us and can safety standards. Recommended for children 3 yrs +. Sunglasses are not UV blocking and should be used for dress-up and pretend play only. If you have any questions about this product by Play Circle by Battat, contact us by completing and submitting the form below. If you are looking for a specif part number, please include it with your message.